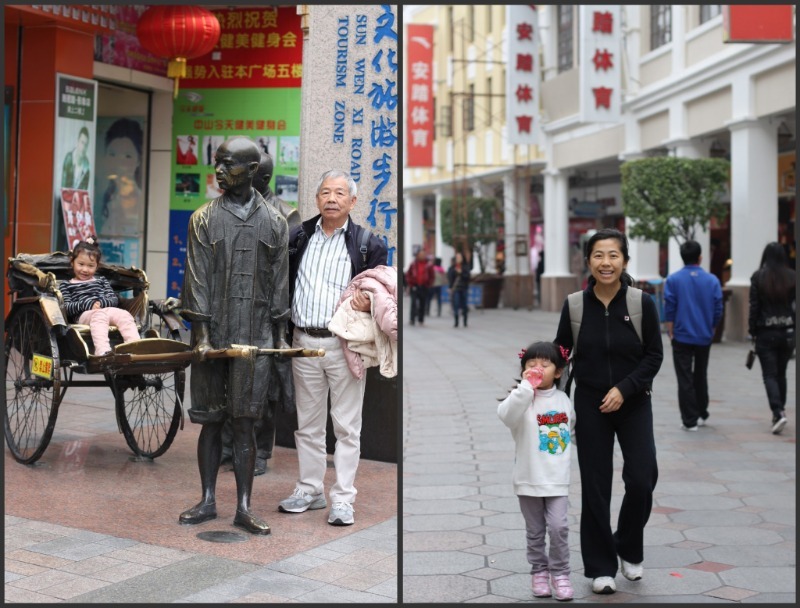 A couple of weeks ago, my sister and I took our girls, along with our parents, to my dad’s hometown in Zhongshan, China. One main reason for taking this trip was to visit my grandpa, who has been residing in a convalescent home there for the past 15 years. Zhongshan is only a 1.5 hour ferry ride from Hong Kong. We took the 9am ferry from Central and arrived at 10:30am. We checked into our hotel first, and then met up with my dad’s cousin for dim sum. This was my first time meeting my Aunt “8C” and she was every bit as pleasant and hospitable as I had imagined her to be after hearing about her for years from my parents. After lunch, we stopped by the Japanese restaurant at the hotel to order some take out sushi for my grandpa (he loves sushi!) and cabbed over to the convalescent home. I’m not sure why my grandpa has insisted on staying at this place for so many years, as he complains about every aspect of it from the nurses to the food to the overall environment. 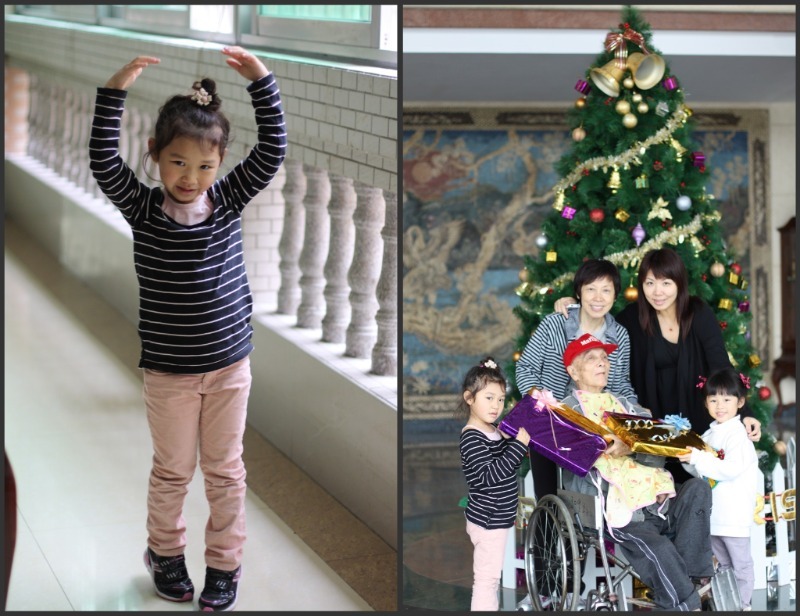 My mom has tried many times to transfer him to the convalescent homes in Hong Kong, where his friends and families can easily visit him and conveniently take him out in his wheelchair, but time after time, he has refused to be transferred. I’m sure he has his reasons, and maybe one day, we will know…..but for now, he’s made this place his home. My heart always hurts when I am there, for I feel the pain of their loneliness through the silence. My sister made an interesting comment to me. She said when newborns arrive to this world, they are welcomed and loved by everyone, despite their neediness and dependence. But when elderlies are no longer self-sufficient, they are often viewed as a burden, and end up leaving the world with nobody around them. I found that comment strangely truthful, but disturbing. I pondered on it for quite some time. 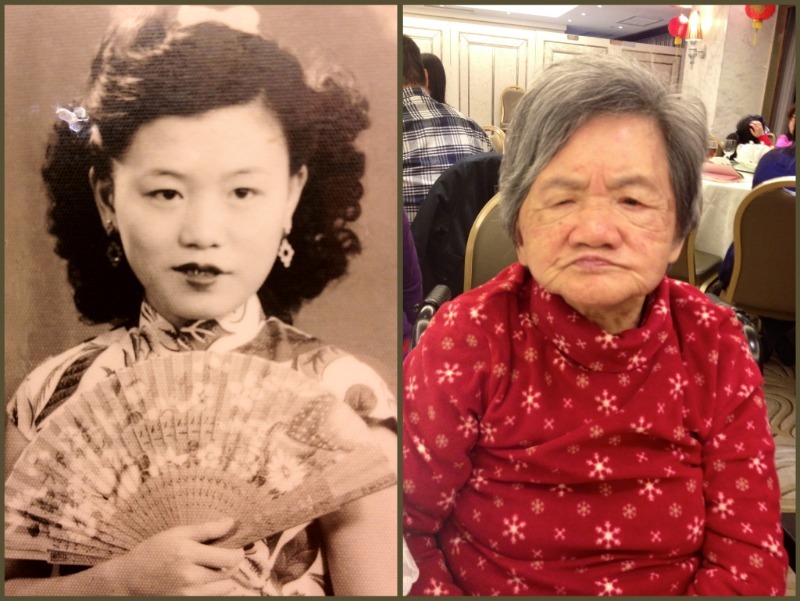 I looked into the eyes of some of the older, handicapped people at this convalescent home, and for just a split second, I could see beyond the wrinkles and sadness. I saw history. I use to volunteer at a convalescent home many moons ago, and I will always remember some of the conversations that I had with the elderlies there. They all had something in common. They loved to tell stories. And boy, did they have stories to tell. Lots of them. My job as a volunteer there was to spend time with them, so I would sit by their bedside as they beam with pride and tell me stories about their past. I heard stories about war and famine, about love and betrayal, about families, and along with stories would always be lessons about life that they were eager to share. My grandpa has always been a man of few words, and I suspect that has to do with my grandma being the chatterbox of the house. I remember him as a cheerful, adventurous man with a passion for fishing and cooking. Despite his bad fortune of becoming handicapped after a freak accident 15 years ago, he still tries to maintain a positive spirit whenever we visit him. This time was no exception. 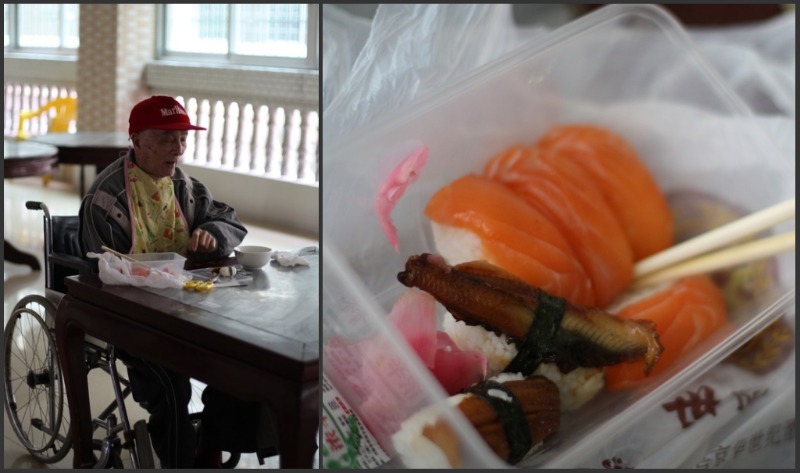 He was perky and funny and wasted no time indulging in the sushi that we got him. I love that children are oblivious to the sentiments that adults have, and they can be totally happy-go-lucky no matter where they are. In the short amount of time that we were at the convalescent home, Brianne and Bridgette brought with them life and laughter to their great grandpa. Zhongshan is quickly becoming one of the more developed areas in Mainland China, though they’ve still got a long way to go in their hospitality and customer service arena, amongst other things. A perfect example is their lack of vehicles to transport the handicap around. Even though we are willing to pay good money, it is pretty impossible to find a wheelchair accessible vehicle to take my grandpa out, so we always end up having to push his wheelchair ourselves to the one and only restaurant nearby his convalescent home. Dinner with grandpa was intriguingly interesting, because I noticed how he likes to repeat himself over and over again these days. Perhaps it’s a sign of his aging and deterioration, although on the surface he’s still very perky and alert. I kept looking into his eyes, trying to see through the wrinkles to read what he was really thinking inside. I wondered if he spent his days reminiscing about life as a young adult and the “good ole days”. I did the same with my grandma every time I visited her on this trip. I saw her staring into space often, with a very particular look in her eyes. I am sure she is constantly thinking about the past. I wish so much that I am able to have videos or a movie of my grandparents when they were young. What were they like when they fell in love? My mom keeps in her wallet this beautiful photo of my grandma when she was 18 years old. Today, my grandma is 81. But if you try really, really hard to look through her tired, wrinkled eyes, I believe you can see deeper into her soul and feel the vibrancy of her youth. This woman is one of the strongest, toughest woman I have ever met in my life. Although she is now immobile and completely dependent, I can still feel that strength in her all the time… The determination to walk again by herself, even though multiple doctors had proclaimed that there was not a chance that she’d ever wake up from her coma after the stroke, much less sit up or walk. In just 1.5 years, she proved all of them wrong, time after time. The doctors called it a “rare miracle”, but everyone who knows my grandma will beg to differ. Together with my mom, the equally strong daughter that she raised, my grandma pulled through like she always does, demonstrating to all of us once again that willpower can sometimes conquer all. Part II. will tell about the amazing experience that we had in Zhongshan as we took a walk back in history to get to know my dad’s youth. 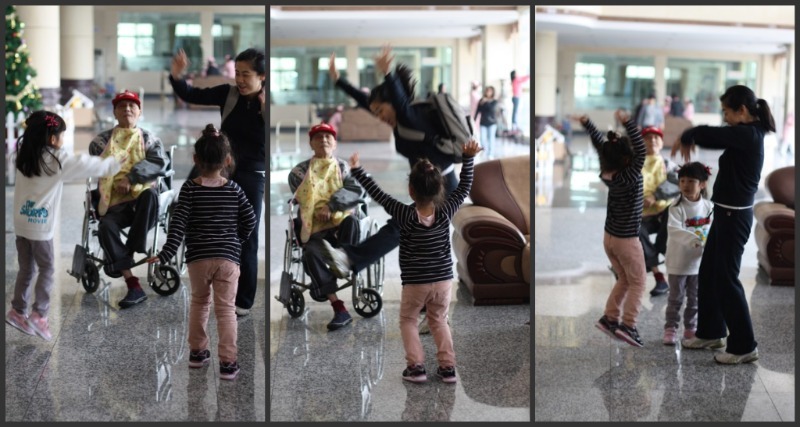 Societies are putting more money in the growing up of children, but spend little money in the caring life of old people. I think the main reason for this is, “there will be no return from these fading away lives!” Remember, everyone of us shall face same situation and condition when we’re old. Please love and care about our seniors.